Anyone who’s looked into large trees knows that Redwoods and Sequoias top the charts. While we don’t have either of those large trees for sale, we do want to educate you about them. The tallest tree is named Hyperion and is a Redwood located somewhere in the Redwood National and State Parks in California. Because of its rarity, its exact location is secret and only a few special groups of people know exactly where it is. What we do know is that it’s somewhere between 700 and 800 years old! At last measurement it was 379’ 4” tall, and could be taller if it weren’t for woodpecker damage. At that height it’s taller than both the Statue of Liberty and Big Ben! Truly it’s a massive tree, and hopefully we’ll take note of this marvel and do what we can to protect it and those around it. The biggest tree in the world is named General Sherman, after the Civil War general, William Tecumseh Sherman. General Sherman is the largest tree by volume, measuring 274.9 ft tall, 36.5 feet in diameter, and weighing a massive 1,385 tons (that’s 2.7 million pounds)! This doesn’t even include the branches, simply the trunk. It’s also one of the quickest growing living organisms on the planet. 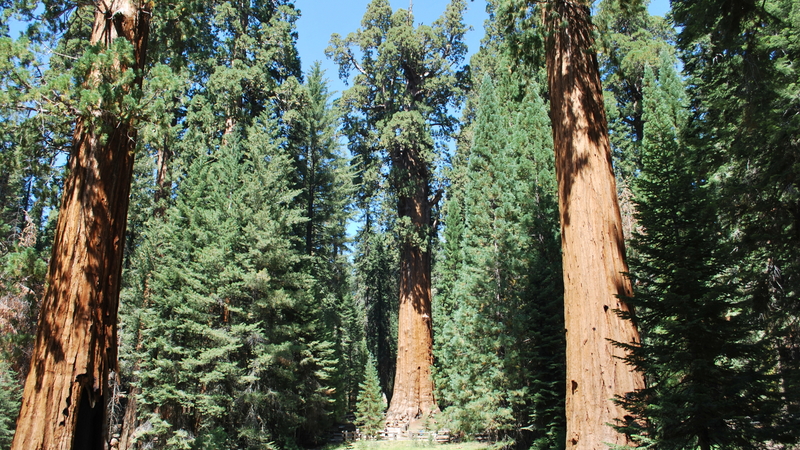 You can learn more about sequoias and redwoods here. Unfortunately, these, and many other, trees are in danger. Due to the increasing population on the California & Oregon coasts there’s an increase of pollution and other deleterious effects. Climate change, yes it’s a real thing, is also negatively affecting the trees. Back in the 60’s and 70’s deforestation and logging were the biggest culprits, but luckily the land has been bought up and is now protected by the National Parks Society. We need to be conscious of the changes we’re effectuating on the world around us. We enjoy the world of today because of the efforts of our parents, grandparents, and others that have come before us. We, in turn, need to make sure that our progeny have a world to grow up in as well. Hopefully you feel a bit smarter and have a greater appreciation for great trees. You can do your part by coming by our lot and seeing our large trees for sale. While our biggest trees are only in the 30’-35’ range, they’ll fill up your yard quite nicely. You may call us at (385) 257-0055 or send us an email if you have other questions.